A Myelogram is a special spinal x-ray exam to find what is causing headaches, numbness, or weakness in the back, arms, or legs. An IV contrast dye is also used to show an outline of the spinal cord and nerves. 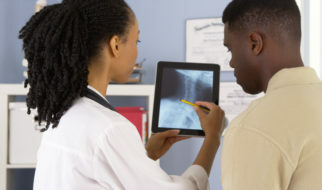 This test is often used in conjunction with MRI, CT, or a regular spinal x-ray.